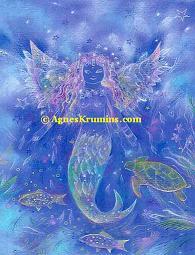 Do Fairies, Angels and Mermaids exist? Or, are they just fantasies of our imagination? 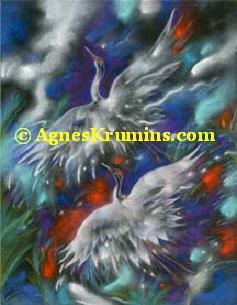 Agnes Krumins knows they exist, and she’s telling the world about their sacred reality, our inseparable relationship we have with them, and the messages of hope and wisdom they offer humanity. "When I was a young girl, I remember my mother and grandmother took me to a beautiful European Polish church. The sunshine streamed in through the stain glass windows, and the rays of light poured down on the wooden seats of the church. As I was praying, suddenly the church seemed to light up and I could see rays of bright light streaming into the church. An angel appeared to me. It felt surreal because the surroundings of the church seemed to fall away from my awareness, and I focused intently on the angel before me. It was just me alone with the angel. 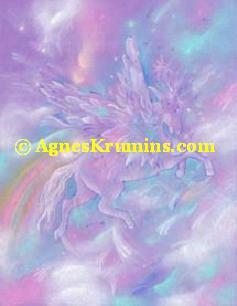 She glowed with magnificent pastel colors, and seemed to dance across the floor. 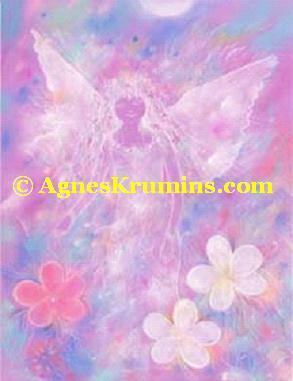 Shimmering with pinks, pale blue, white and hints of bright yellow, she wore a long white dress and her body was tall with large white wings. Her face radiated love. At the moment the angel appeared to me, I knew I was loved by God. I was safe and I was protected. This inner knowing made me feel very comforted. I knew my angel would protect me, no matter what circumstances I was in. Many years passed until I saw this angel again. At that time, I needed a lot of physical healing. When the angel appeared the second time, I was told telepathically that the name of the angel was Archangel Raphael, the angel of healing. She looked exactly the same as she did years before, and her light lit up the darkened room I was in." "One day I visited my “fairy grove” near Diamond Head crater next door to Waikiki Beach and the Honolulu district in Hawaii. Fairies love to live in groves, especially where trees grow in a circle. The energy of a particular grove is very important. When it holds a high amount of “feel-good energy,” it usually indicates a high level of joy and peace, and fairies feel comfortable in this type of environment. All of a sudden a beautiful large fairy appeared to me, and the grove seemed to light up and became brighter. She identified herself as the head fairy of this particular grove. She stood about three feet tall – the largest one I had ever seen – and dressed in a vibrant red dress with short sleeves. She was very beautiful and her face was youthful and radiant like in her teenage years. 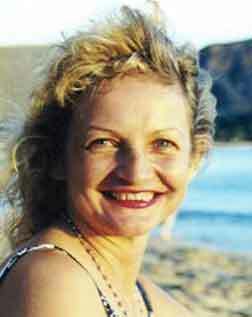 Her beautiful white skinned body had a thin stature and long thin arms. She had delicate translucent gossamer wings that vibrated but didn’t flutter. I could feel the energy from her heart connecting with my heart, and I could feel she cared about me. Though she was very busy taking care of the plants and flowers in the grove, making sure they all had nutrients and energy (the color red represents energy), she communicated with me telepathically while doing these tasks, and I could feel her love-sharing vibration. The big red fairy communicated several messages: Fairies have chosen to hold the power of love that sustains the earth. All of nature is pulsating with divine love. We can tap into nature’s power of healing energy that fairies use and enjoy the smallest details of nature. Fairies exist in the oddest places, even among large populated cities as well as in remote forests and beautiful gardens. The key to communicating with fairies is our desire to acknowledge this realm of existence and seek to understand its purpose and feel gratitude for being co-creators and stewards of earth with them. Gratitude is a very important characteristic with all my experiences of the subtle realms because it raises our awareness of their existence. We need to love and talk to our trees and flowers. All our gardens, whether they are public like the one I experienced at Diamond Head or a tiny garden on the deck of your home, are pulsating and vibrating with color and life and fairies." "I visited an ancient Hawaiian portal at Makapu’u beach in Waimanalo on the windward side of the island of Oahu in Hawaii. It’s one of my favorite healing spots, and it’s a magnificent day. The Pacific Ocean is crisp, turquoise and clear. I feel the healing energies of the Goddess Pele as I sit on the hard black lava. My heart is open in this sacred place. Today I am blessed to see with clairvoyant eyes into another dimension. Through the veils that hide parallel dimensions, I am transported into the mystical mermaid kingdom. I see very clearly a mermaid rising up from the ocean. Her hair is long and dark brown. Her tail is clearly visible and it looks strong as does her whole body. But, I am not so focused on her physical appearance as I am on her aura or etheric presence. 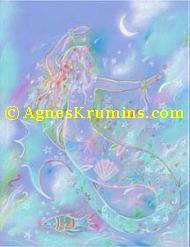 Her aura is infused with a clear turquoise color, a very healing nurturing color. 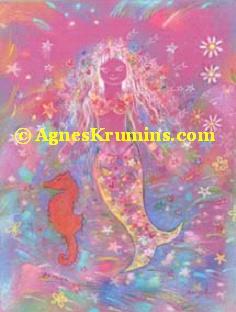 Our world has different perceptions and attitudes about mermaids. Because of our prevailing indifference and disbelief, it appears as if mermaids don’t exist since we oftentimes do not see them. Indeed, it is this apathy that prevents us from seeing them. We must raise our love and conscious awareness to see and interact with them. We must change our perceptions and attitudes and include them in our responsibility to be benevolent stewards of Mother Earth." 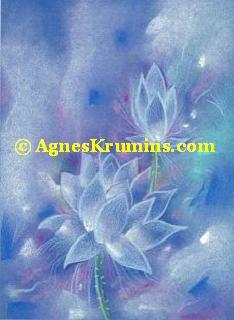 Agnes Krumins is an accomplished freelance painter and visual artist, specializing in healing spiritual art. Her medium is acrylic on canvas and mixed media on paper. Her artwork is represented internationally in specialty retail stores, art galleries and private collections. 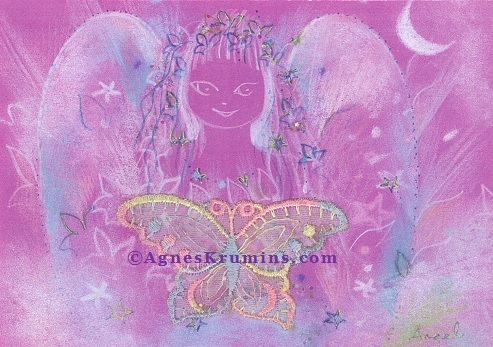 Agnes is the creator of the Healing Gateway – a powerful artistic expression that provides a bridge to healing, inspiration, empowerment, creativity and transformation.